The International Language Academy of Canada (ILAC) is one of the best-known English language schools in Canada. For 20 years, ILAC has offered international students a full learning experience, which includes English programs, exceptional customer service, exciting social events and a dynamic atmosphere. 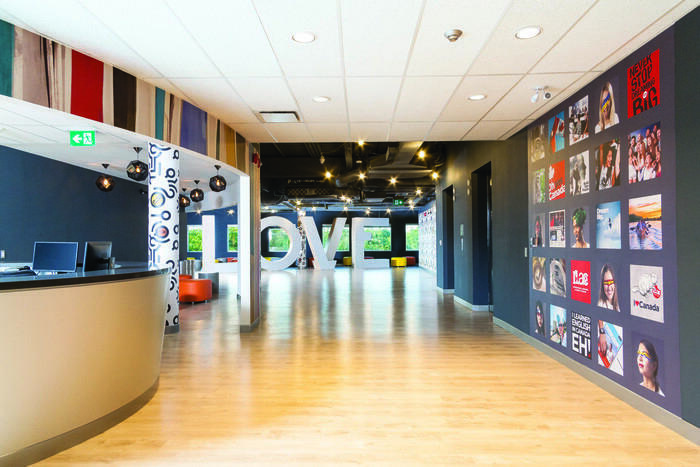 Our newly renovated campuses (five in Toronto and four in Vancouver) feature modern interior design and a vibrant learning environment. Every year ILAC welcomes thousands of students from over 75 countries, creating a great diverse student population at the school. Change your life in Canada with ILAC! ILAC offers english lessons for students from 14 years old only during June, July, August (for summer) and January (for winter). ILAC offers english lessons for students from 16 years old all Year-Round. *schedule in winter and summer are different. ILAC is a school where you can learn english with wonderful teachers and share your knowledge and culture with the world. People from many countries and different accents that help your fluence. There are many activities to know the city and practice what you learn in class. The buildings are near subway, making your life easier. Simply the best! Ilac is just the best english school in Canada. There are people from the whole world. I met people from countries that I never thought I would. It's just one of the best experiences in my life. The teachers, people and anything I needed, Ilac people was there to help me. I am really grateful for everything. I've enjoyed the most! Thank you!! It was such a good opportunity for me to improve my English skill by attending classes at ILAC, in terms of writing essays in MLA format, how to study IELTS, etc. Teachers were also very nice, and it was also a nice chance to make lots of friends from many countries all around the world. As a student who recently finished the Pathway Program at ILAC, I can highly recommend the school. I started in intermediate level last year, and after 4 months I started in Pathway. Not only the curriculum is one of the most prepared that I have ever met, but also all the teachers are completely able to answer each question that students might present in any academic field. During my period as a student in the program, I never stopped my learning process. All the time I was learning different skills as well as reinforcing each weakness. Nowadays, I can totally suggest the school because thanks to them I am able to go to college and write essays, do research, and explain any topic in front of the audience and professors as well. Directors, ambassadors, coordinators, teachers, all of them are always attentive to everything, and meeting them made a huge difference in my life. Thanks to all the staff at ILAC for give me the skills that I needed to follow my dream. Pathways class has been amazing, I felt my english improvement after one week. Teachers are well prepared and activities in class are always interesting. Estando al 75% de mi estancia, la experiencia es muy recomendable. El asunto alojamiento es SUERTE, por lo que si no sois gente con suerte, recomiendo apartamento só[email protected] o con classmates. ILAC is the best Academy in Canada. When i studied in ILAC, I met many friends who is from over 10 contries. I think that the teachers are great and many staff are kind and helpful!!! I appreciate the ILAC teacher and staff and i never foget my memory which was studying Engilsh... thank you! !